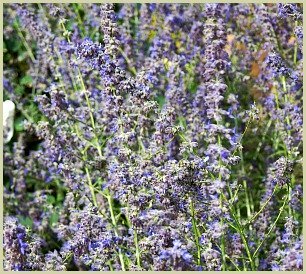 While it’s called Russian sage, the perennial known as Perovskia atriplicifolia isn’t actually a sage at all. It is understandable however that it gets lumped in with the other salvias, as it has a strong fragrance very similar to many varieties of sage. This flowering herb is native to the plains of central Asia, in an area stretching from Tibet to Iran. It is relatively new to western gardeners, only becoming easily accessible just before the turn of the 21st century. Click here to read about Texas sage, another "pretend" variety. It is named after a Russian general who discovered the plant as he led his army into Afghanistan in the mid-1800s. It is said that these soldiers brewed Russian sage into a tea to treat fevers, learning the skill from the local peoples. It's a perennial shrub with silvery grey leaves and grey stems that grow up to roughly four or even five feet tall. In the late summer, this plant blooms with pretty small deep blue or lilac flowers. The fragrance of this plant comes from its stems and leaves, and you can really smell its strong scent when you crush or bruise the leaves in your fingers. If you want to add some to your garden, find a sunny corner. The perennial needs full sun, but it surprisingly tolerant of cold temperatures so can thrive in northern climates. It is also very drought tolerant and requires little maintenance. Make sure to plant in soil with excellent drainage. It starts to flower in mid-summer and that will continue through into late fall with a little deadheading. Russian sage is also great for the garden as it attracts butterflies, and it is a lovely cut flower to bring into your home for a burst of scent and colour. Make sure to prune hard in late spring to ensure strong new growth. Do not prune after the plant flowers in mid-summer. In many Asian cultures, this variety has been used to treat stomach ailments including dysentery. It is a partly edible herb with an interesting peppery flavour. The flowers are the only part of the plant that is edible, so make sure to avoid eating the slightly toxic leaves. Those can be used in fragrant pot pourris. The fresh flowers also make a nice addition to fruit salads and cocktails. They are also lovely on a cheese plate for both flavour and colour.